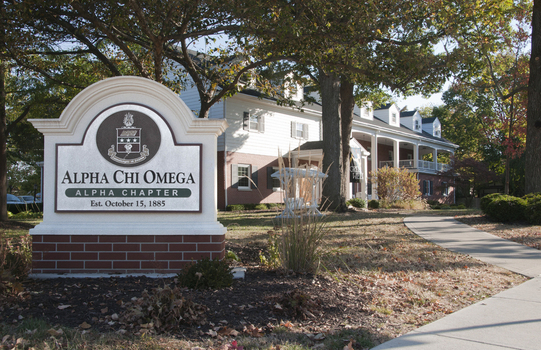 Alpha Chi Omega was founded on October 15, 1885 in East College at DePauw University. Seven female students, Anna Allen, Olive Burnett, Bertha Deniston, Amy Dubois, Nellie Gamble, Bessie Grooms, and Estelle Leonard were encouraged by James Hamilton Howe, DePauw’s music school dean, to form a women’s society within the school of music. The women established the sixth women’s fraternity in the country and the first to be associated with a school of music. Believing this fraternity would be the last of its kind, the women chose the Greek letters Alpha and Omega as the first and last letters of the Greek alphabet, signifying the beginning and the end, with Kai meaning “and” later changed to the Greek letter Chi. Our founding sisters, inspired by the color of the leaves on the East College lawn during the time of the fraternity’s establishment, chose the colors scarlet red and olive green. The lyre was chosen to symbolize Alpha Chi Omega’s musical history. The founding sisters created the open motto “Together let us seek the heights,” encouraging future Alpha Chi Omega’s to embody the five national membership standards: Financial Responsibility, Character, Leadership Ability, Academic Interest, and Personal Development. Upholding such values, Real. Strong. Women. is Alpha Chi Omega’s brand. Alpha Chi Omega focuses on developing Real Strong Women who become leaders in both their communities and the sisterhood. The Alpha chapter here at DePauw University is currently composed of 117 real, strong women. Our chapter supports our national philanthropy, Domestic Violence Awareness, through several events held each year. In October we host our Domestic Violence Awareness Week where we highlight how to recognize, prevent, and be an active bystander against domestic violence. Healthy Relationships Week is held in February. Our chapter organizes events, information sessions, and open discussions about how to establish and maintain healthy relationships with family, friends, significant others, and yourself. Finally in the spring, we host our annual fundraiser, Strut-a-thon, where teams relay race in high heels to raise money for the Putnam County Family Support Services. To increase our own chapter’s awareness, we were the first sorority at DePauw University to complete Green Dot training, a program dedicated to educating college students on becoming active bystanders, preventing forms of violence in our community. February is dedicated to celebrating MacDowell month, honoring the arts and our musical heritage by attending exhibits, concerts, performances, etc. Our chapter also participates in performing acts of service for the happiness and well-being of others to commemorate the goddess Hera known as Hera Day, held nationally on March 1st. As a chapter, Alpha Chi Omega places a strong emphasis on cultivating well-rounded women while maintaining the highest standards in academics, cultural awareness, and leadership ability among other values as aligned with our five membership standards. We are proud to say that our sisters are leaders not only within our chapter, but also among campus organizations and programs including: all five of DePauw’s Honors and Fellows programs, presidential ambassadorship, student council, DePauw’s media outlets, which include WGRE, D3TV, and The DePauw newspaper, DePauw’s Music School, and athletic programs. Our members are leaders in various campus organizations like Timmy Global Health and Dance Marathon as well as First-Year Mentors and Academic Resource Center tutors. We have the expectation that our sisters develop skills that can be applied both in the classroom, extracurriculars, and beyond their DePauw experience. The chapter maintains the ideal that each member is always representing the values of Alpha Chi Omega wherever they may be. We cherish our sisterhood and take pride in supporting, setting, and achieving goals for ourselves, our sisters, and our university during and after our time as collegians!